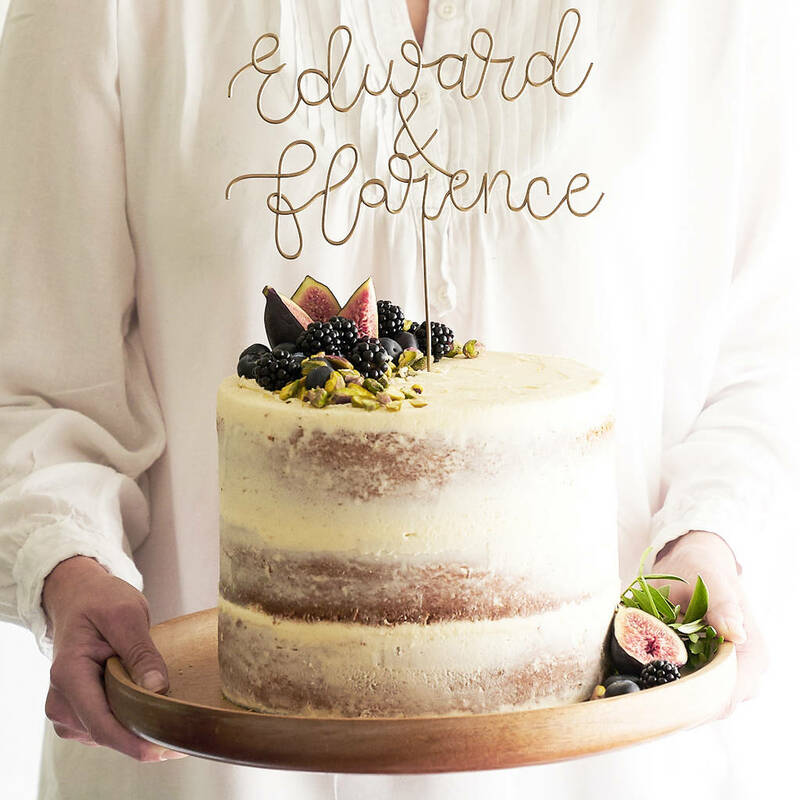 With many personalised engravings to choose from Wooden Wedding Cake Toppers come in a variety of different hardwoods and in a wide range of shapes, sizes, and finishes. 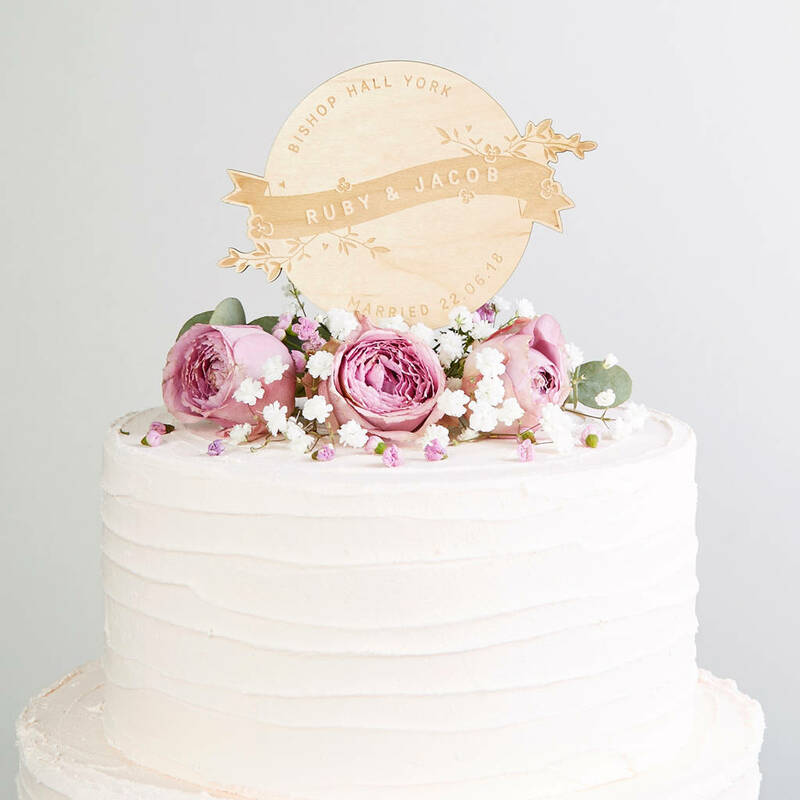 A beautiful keepsake to store away as a lasting reminder of your special day, this subtly stylish circular wooden wedding cake topper with banner and intricate floral detailing, is crafted from light birch wood and personalised with names, wedding venue and date. 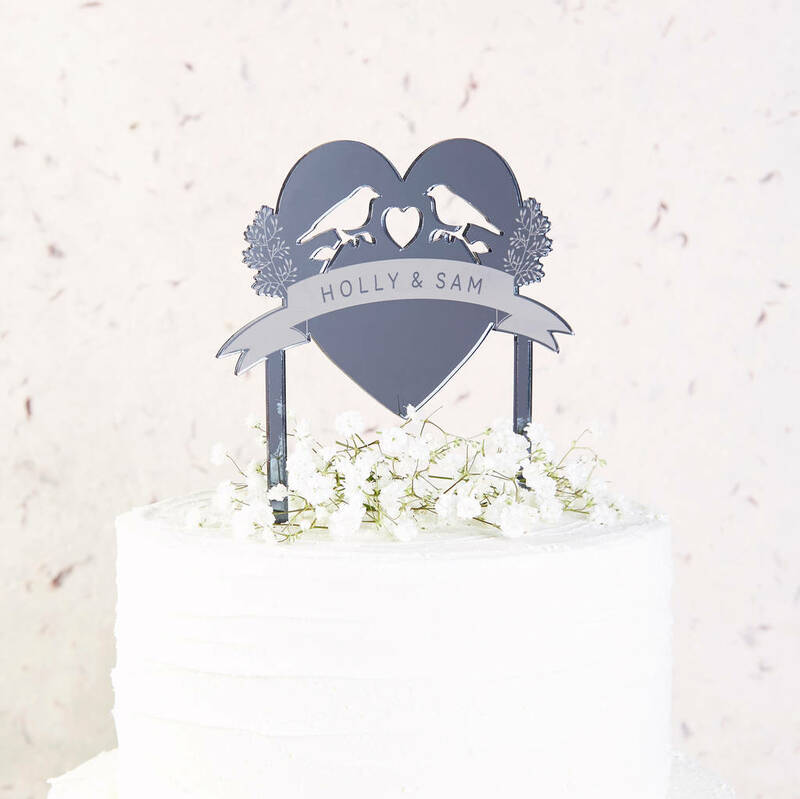 A real showstopper this personalised heart shaped cake topper is available in a choice of 3 sizes and would sit perfectly on top of any cake, big or small. Choose from a mirrored acrylic, birch, walnut or cherry wood finish, and personalise with names and the date. Unashamedly flashy and with a reflective finish that will dazzle your guests, these Personalised Mirror Finish Wedding Cake Toppers will catch light and lenses beautifully. Wonderfully romantic, the bird wedding cake topper includes hearts, flowers and lovebirds and can be personalised with the bride and groom’s names. Available in a choice of 3 mirrored finishes, gold, bronze, or our favourite, midnight grey, as pictured above. 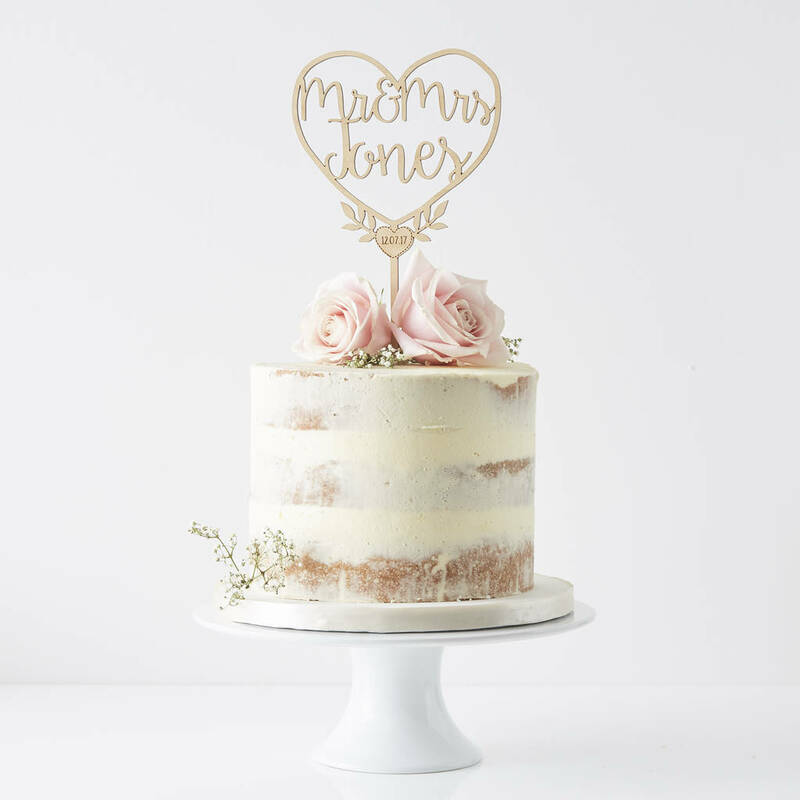 Chic and sophisticated, the surname wedding cake topper comes in a choice of mirrored finishes including silver, gold or rose gold. A simple yet classy design, this wedding cake topper will add a little something special to your wedding cake without overpowering it. 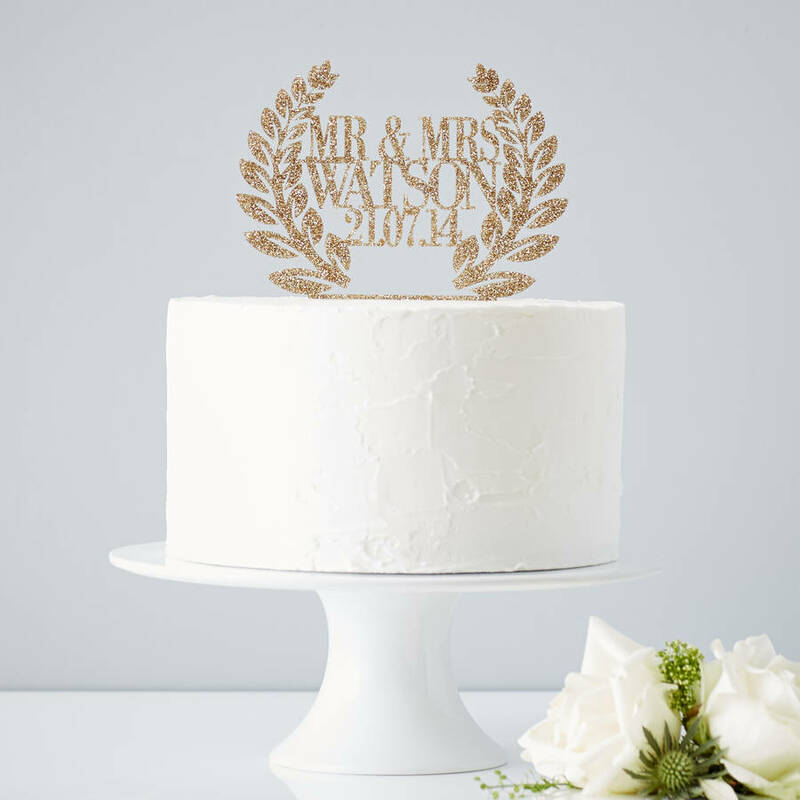 Stainless Steel and Wire Personalised Wedding Cake Toppers are available in a variety of finishes including copper, gold, and silver, as well as powder-coated painted options. 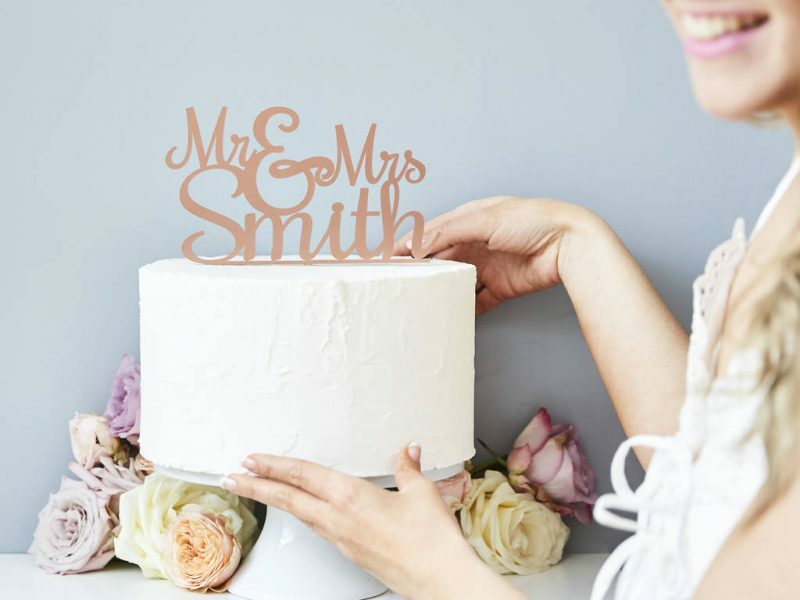 This powder-coated stainless steel cake topper is personalised by handcrafting the wire into a continuously flowing line of italic script to create the couples names. Choose from 3 stem lengths and smooth finishes including copper, silver, gold, black and white. 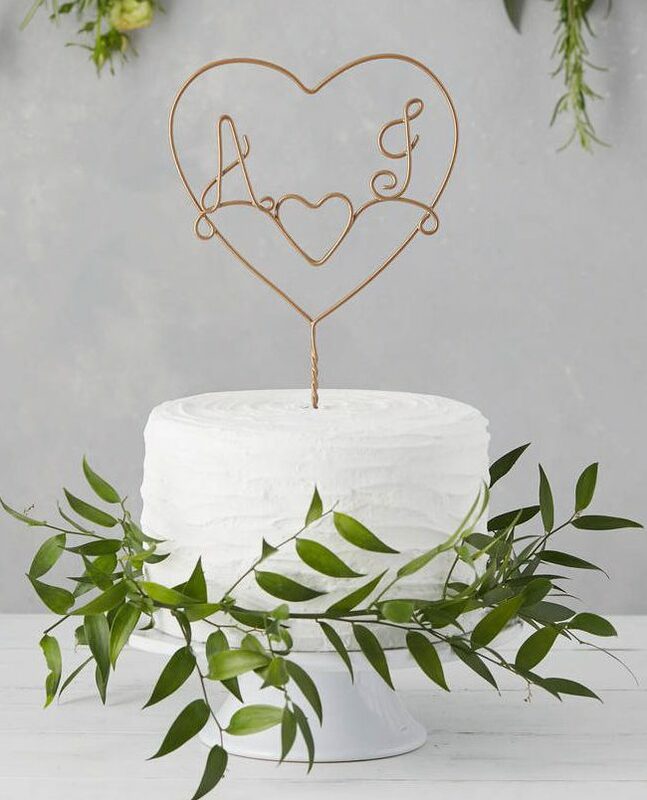 Handcrafted from powder-coated stainless steel or copper wire and welded together for extra strength, the double heart wedding cake topper can be personalised with the happy couples initials and finished in a choice of modern paint colours or metallics to suit. Acrylic Personalised Wedding Cake Toppers can be completely transparent or found in a variety of different colours and finishes to match in with your wedding colour scheme. 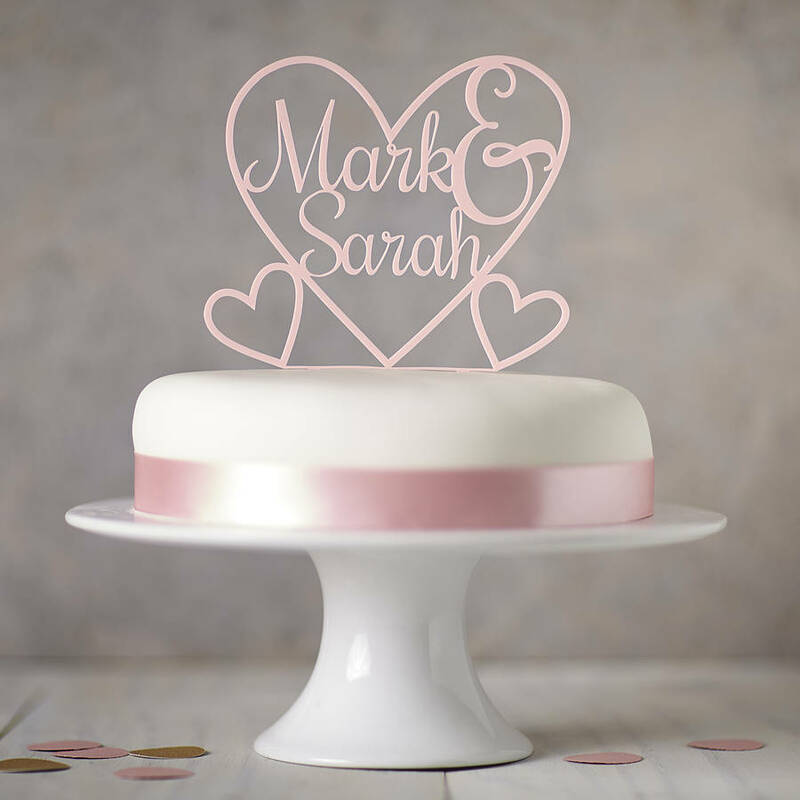 Available in a huge choice of solid and frosted colours, as well as modern glitter finishes, the heart cake topper, pictured here in pastel pink, can be personalised with two names within a heart, for the ultimate declaration of love placed on top of your wedding cake. 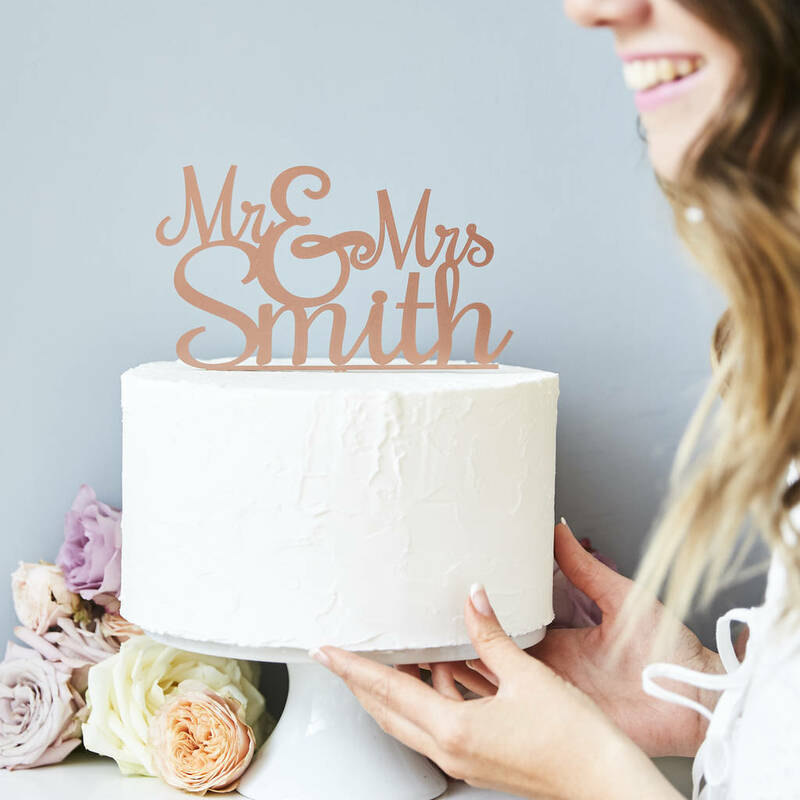 A firm favourite of ours, the standout acrylic ‘Mr And Mrs’ Wedding Cake Topper is available in a wide selection of solid colours, as well as frosted, metallic and glitter finishes, and can be personalised with the happy couple’s surname in a fancy curved font. For those who love a bit of glitz and glamour, a Personalised Glitter Wedding Cake Topper will stand proud and command attention on top of your wedding cake centrepiece. Made from transparent acrylic with real glitter inside, making it visible from all sides, for maximum sparkle and shine, the wreath wedding cake topper is available in gold, black, pink, green, silver or gold. Personalise with the couple’s surname and wedding date. 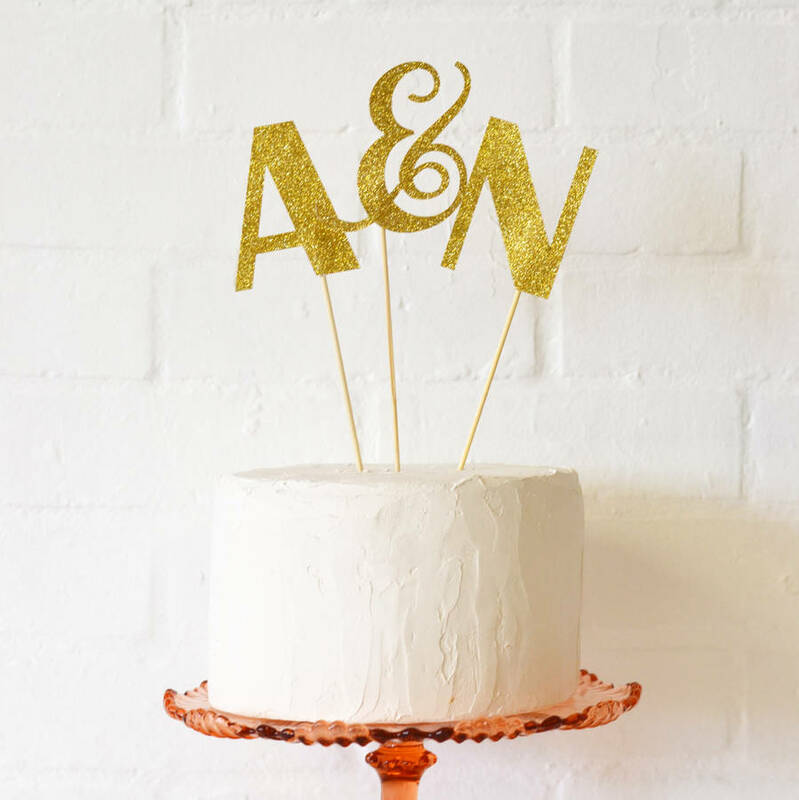 Available in 5 glittery colours including gold, silver, and champagne to add instant sparkle, this simple yet stylish celebration cake topper comes complete with personalised initials and will be lovingly handmade using premium quality glitter card and bamboo sticks. Following a specific wedding theme or looking for something a little more unusual or kooky? 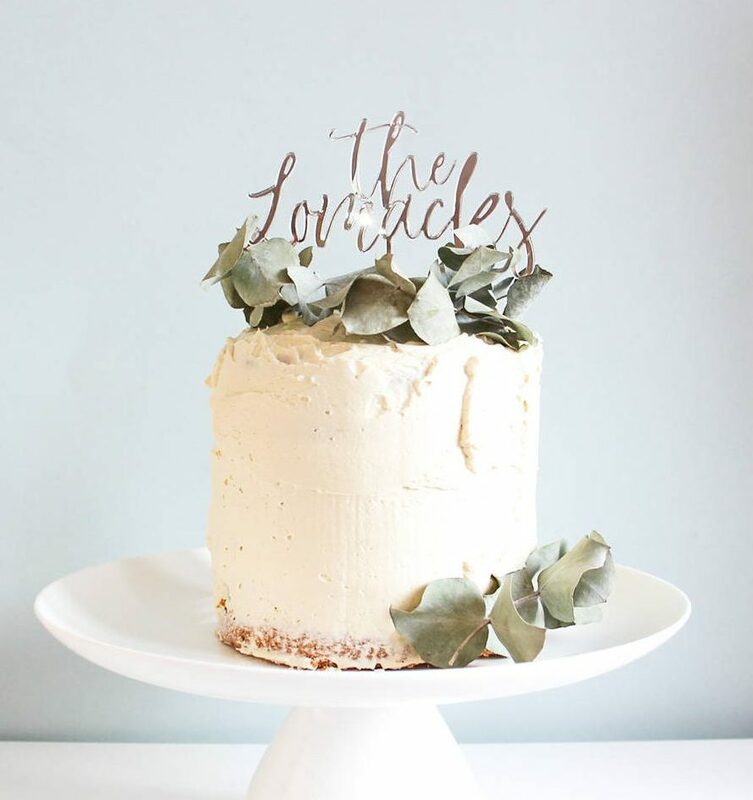 A fun Personalised Themed Wedding Cake Topper could be just the ticket! 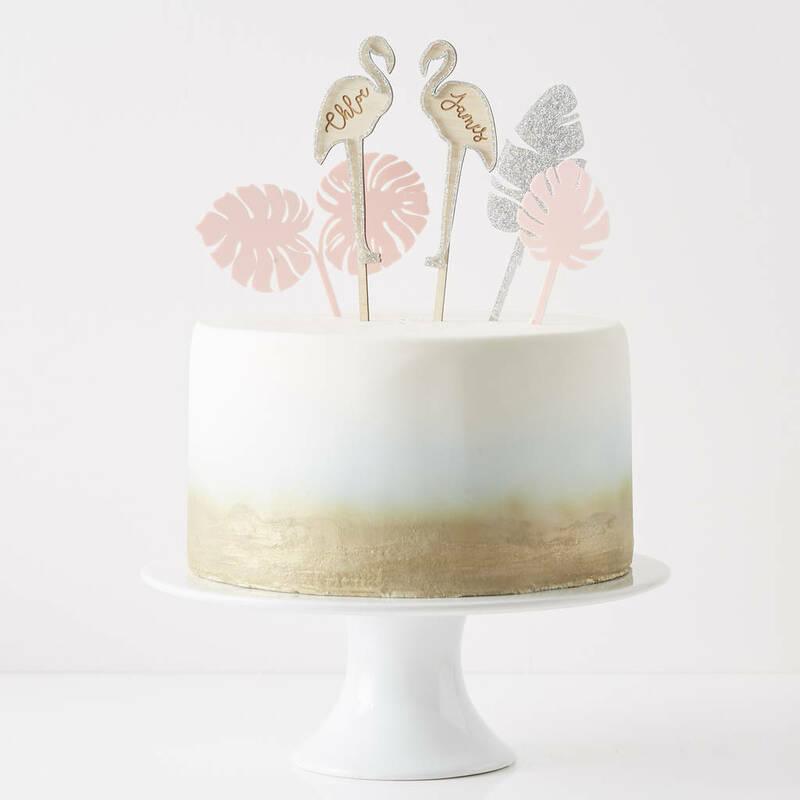 This tropical themed wedding cake topper set is so on-trend and contains multiple eye-catching design elements, including personalised flamingoes and tropical leaves, all of which can be created in matching or contrasting shades to fit in with your colour scheme. 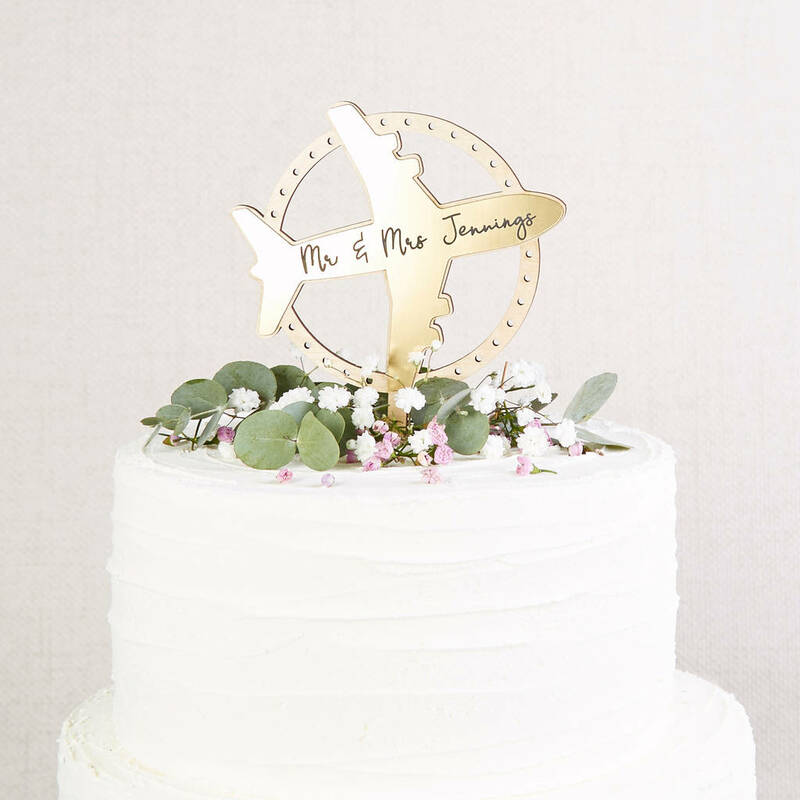 For an adventurous pair who love exploring new places, the travel theme wedding cake topper makes the perfect statement. Combining metal on top of wood, choose from a stylish gold or copper rose finish, and personalise with the happy couples surname, ta-da!